Dogs teach us about friendship, loyalty, love and how to be happy with the simple things life has to offer. We want to give you peace of mind that when you drop your dog off with us our experienced playground leaders create a structured day of fun and love. Born and raised in Northglenn, CO, Valerie has always had a soft spot for animals and would eventually like to be involved with a dog rescue. She spent the last 30 years as a bookkeeper, with the last 20 being for Dave Query, owner of Big Red F Restaurant Group and learned first hand everything it takes to build a business. 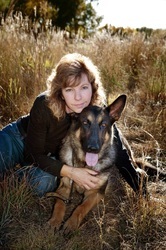 Valerie has decided to finally follow her passion and do what she loves, which is working with dogs. "Dogs represent all things good to me" says Valerie. "I had two rescue dogs; one from the Boulder Humane Society and one rescued from a puppy mill where it had been for 7 years. Lastly, I rescued my German shepherd Rogue (left). She had a broken heart and from that surgery on she won everyone's heart. The love she gave me was so huge I knew I had to give it back...and DogLife was born".